How to maintain healthy trees. Trees have had a lot to put up with this summer. Endless days of glorious sunshine can be less glorious for trees which may become stressed, sick, or even die when they find themselves in comparatively extreme conditions. Therefore, it’s quite important that we can spot signs of stress in trees, treat them promptly, and try to keep them healthy. Trees produce new growth every year on their trunks and their branches. Obviously, different species vary in their annual growth, so if you measure the distance between this year’s and last year’s growth you’ll see how much it is, and you can work out what growth to expect next year. No signs of growth should ring alarm bells that the tree may be struggling. Get rid of broken or dead branches straight away as they encourage insects and disease. You can easily check whether a branch is dead by scraping it with your thumbnail as living branches are green underneath the bark. Also, if you bend branches gently, living ones will be supple and dead ones will break. Apart from certain trees such as birch or maples, bark should not peel away or be loose from the wood underneath, nor should there be fungi growing on the trunk as damage to the bark can expose the tree to attack by insects and diseases. So, be aware that there should not be any large cracks or holes in the bark. For evergreen trees, keep an eye on them for any sections that have leaves missing all year round, (for deciduous trees, you can wait until new leaves appear in the spring to judge whether there are any problems). If you do spot any bare patches, it may be because that part of the tree is not getting any water, you are not pruning it properly, it may have been damaged by weed killer or pesticide or it has fallen prey to a disease, so be vigilant. If a tree is wilting, it’s a sure sign that it’s distressed. This could be due to lack of water or over-watering (you’ll know it’s overwatering if the leaves are yellow on the inside). Either too much or too little sun, disease, over-fertilisation or, if it’s potted, it may be root-bound. Look at the leaves as they are good indicators of a tree’s health. Be suspicious if they unexpectedly turn yellow, become stunted, or are oddly shaped as these are signs of nutrient deficiencies, insect damage, too much or not enough water, chemical damage or diseases. 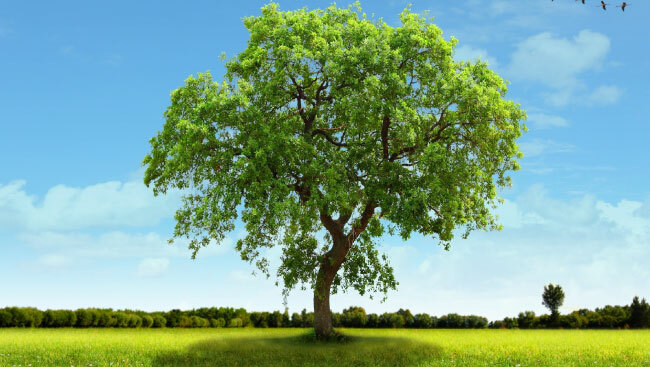 Most landscape trees should be pruned so that they have only one central leader – the main upright stem. This adds strength and stability to the tree’s structure, as well as giving it a straight appearance. So, prune back or remove any branches that are competing with the central leader because if there is more than one, it may eventually cause the tree to split in two. It’s worth mentioning however, that some trees grow naturally with several trunks or are pruned for topiary including espaliered trees, so do your research first. Remember that keeping trees healthy in the first place is the best defence against disease –and be extra vigilant in summer as this is the peak time for diseases and insect attacks so if you’re not sure, try to get specialist help.